I grew up in the western part of Denmark in a village a couple of miles outside a little town called Ringkøbing. Statistically this should make me one of the happiest people on this planet. Not only has Denmark on several occasions been proclaimed the happiest country in the world – most recently by the 2013 World Happiness Report published by the UN – but in 2007 Ringkøbing was even proclaimed the happiest city in Europe. Looking back at my childhood I must admit that I did not really notice this extraordinary happiness, which allegedly surrounded me. And maybe that is not all too surprising. After all these happiness surveys only tell a tiny bit of the story about human happiness. Nevertheless all this talk about my happy home country has got me thinking. Denmark is in many ways a quite pleasant country to live in – if you do not mind all the rain and wind and the long winter nights – so it might well be that Danes really do feel a significantly higher satisfaction with their lives than e.g. their German neighbours. But what could be the reason for this and what kind of happiness would this amount to? Being already interested in Stoic ethics this is where I turned for answers and Stoic views on human nature did prove themselves to be an inspiring model for thinking about human happiness. With its strong intellectualism and focus on an ideal and presumably unattainable form of human happiness Stoic ethics might not seem like the most suitable model for analysing a modern society of normal human beings. But at the core of these doctrines lies a conception of human nature which is far closer to the everyday reality of actual societies. The Stoics, like Aristotle before them, thus basically thought of human beings as rational animals, which therefore, just like other animals, have an instinct for self-preservation and care for their offspring. Their share in reason, however, sets them apart from other animals and lets them develop a thirst for knowledge as well as a far more sophisticated sociability than any other animal species. According to the Stoics, and all their contemporary philosophers, the key to happiness was to live in accordance with this nature. This means that whereas animals reach their goal in life just by preserving the existence of themselves and their offspring, humans have to go further than that. Since reason is the distinctive trait of human nature the full realization of this rational potential is what ultimately leads to happiness. Attaining a perfect understanding of all things will thus necessarily lead to a life in accordance with this knowledge, i.e. to a life in accordance with nature – a life that to the outside is characterized by perfect conduct in all its aspects. Compared to this complete revision of our intellectual and moral life nothing else has real value. Perfect knowledge being all but unattainable this doctrine is what informs Stoicism with its strong idealistic strand. Despite this very clear rejection of everything besides perfect knowledge and virtue as being without value, the Stoics also had a good deal to say about the road towards this ultimate goal. A central part of this moral development is the proces of oikeiōsis,which basically describes the recognition of certain things as belonging to oneself and therefore desirable. It is the social aspects of this process of recognition which is interesting to us in this context. Reason thus lets human beings realize that they are not only connected to their own offspring but also to a number of other humans through a range of different relations and ultimately this sense of relatedness extends to the entire human race due to the fact that we all have a share in reason. Human beings therefore have a far more generalized need to care for others than animals do and this is the reason why we live in societies. Satisfying your social instinct on an incomplete stage of insight not embracing the entire human race will of course not result in happiness- just like the gradual expansion of our knowledge will not until it reaches its completion. But advancing on the road towards virtue will lead to some sort of satisfaction which is at least preferable to just giving up and quitting the whole pursuit of an actual completion of our nature. It is this intermediary kind of happiness, or perhaps more correctly, satisfaction that has in particular attracted me about Stoicism. First of all I really like the fact that Stoicism thinks of happiness as practically unattainable but nevertheless as the only sensible thing for a human being to pursue. This somehow fits very well with my experience of happiness and moral conduct. Secondly, and more relevant to the present topic, I feel convinced that the Stoics, and Aristotle before them, were really on to something when they described human beings as “social animals with a share in reason.” Contrary to Aristotle many Stoics took a keen interest in observing the development of this nature in children and as a father of two I can recognize quite a lot of what they are saying. Just like most animals we start out with a need for food and care closely tied to our mother but as time goes by and our horizon expands other people start playing a role in our lives and new things become pleasant and important to us as we get to know more. As adults we end up having multiple and complex needs but they canstill reasonably be said to reflect the same three aspects of our nature: corporeal, intellectual and social. Let us now return to the question I posed at the outset of this discussion, namely whether there is an explanation why Denmark, looking at the society from a Stoic point of view, should be more successful than other countries in promoting the happiness of its citizens. 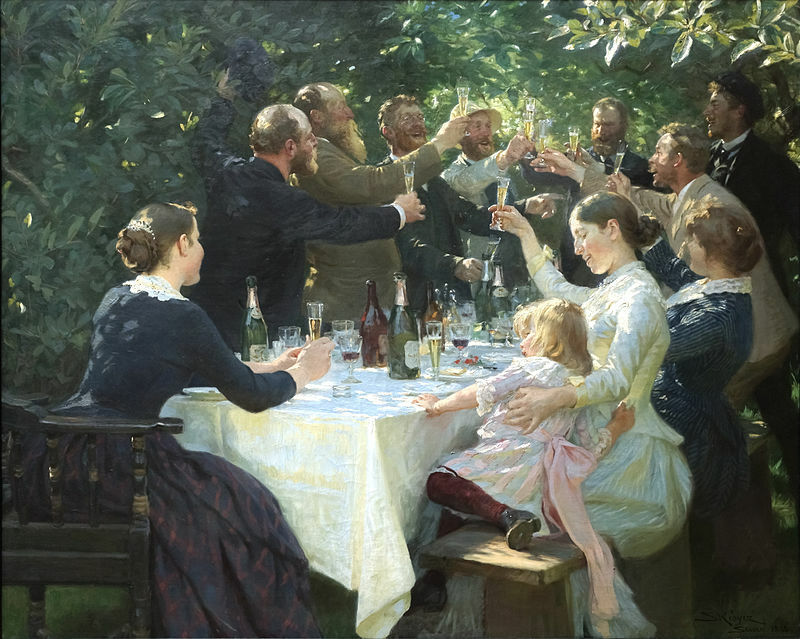 Adopting the Stoic conception of human nature Denmark – and its Scandinavian neighbours with their quite similar welfare state structures – does in fact look quite suitable in meeting at least two of the basic needs of its citizens. Organizing society around the systematic redistribution of material resources the Scandinavian welfare states thus have two major advantages seen from the perspective of Stoic intermediaries. Firstly, it guarantees a high degree of security both in terms of material resources, health and security from crime, that is to say, it effectively helps the citizens to meet their basic corporeal needs. Secondly, the welfare state offers a systematic and quite efficient way of showing the care for others that our social nature impels us to show. This is not to say that the welfare state can replace the personal act of caring for others but the scale of human society simply makes it impossible to care for everyone we meet. This was true of ancient society and it is even more true of modern society with its increased mobility and modern media constantly reminding us of the desperate needs of so many of our fellow human beings. No individual can meet the needs of all his fellow human beings but this is nevertheless what our nature instinctively urges us to do. By creating a system of general redistribution within society where each citizen by paying his/her taxes is taking care not only of his/her own needs but also those of others, the welfare state offers a relief of the frustration created by the gross contrast between what we can do and what we would like to do. It is in this sense that I am claiming that the Scandinavian welfare state might be contributing to the realization of the social nature of its citizens and thus to their happiness in the intermediary Stoic sense. This is all very far away from Ancient Stoicism and probably neither Zeno nor Seneca would recognize their wisdom-based happiness anywhere in all of this. The study of Ancient Stocism, however, is one thing, Stoically inspired reflection on human happiness another. What I am suggesting is that Stoic ideas about human nature offer a fascinating perspective on how we can best organize our societies in order to secure the best conditions for human happiness. On this general, political level wisdom only plays a very modest role. The pursuit of wisdom, and thereby the pursuit of individual happiness, remains a personal concern for each and every one of us. All that society can do is to offer the best possible conditions for this pursuit. Whether Danish society is particularly successful in providing these conditions is hard to say, but to me the alleged Danish happiness makes sense if we look at it from a Stoic perspective. And likewise: Stoicism definitely makes sense from the perspective of a modern day Dane. Tue Søvsø, born 1986, grew up in a village near Ringkøbing in the western part of Denmark. He studies Latin and Greek at the University of Copenhagen and is currently writing his Master’s thesis on human sociability and philosophical argument in Cicero De finibus.